Thanks OP been looking for one glad I waited good price. Looks fab for £5! Thanks. When the f**k did Darth get a castle? 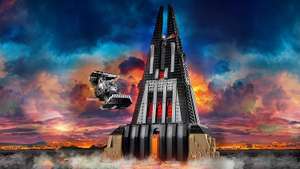 Omg Vader castle its like Santa's castle or like tooth faire castle ? Seen in store at Home Bargains Bangor, North Wales. Not sure if nationwide. Best price i’ve seen. Closest price is £25.99 on Playmobil website with voucher. £44.45 on amazon. RRP £45. Bit misleading! Wondered for 5 minutes why it was £79... title is price per person. This has been reduced again by Argos. Next best price is £31.55 at Amazon. Thank you. This is amazing and will make my daughter's Christmas! Hot, but my kids have more toys than storage place to keep them. Great price. 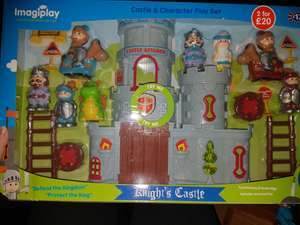 Had I not gotten the big castle when Tesco Direct was shutting down ;) , I would go for this one. Heat added. I brought this last year. My daughters is still in one piece, yeah she has lost a lot of the pieces for it and the cardboard pictures have all come out the windows but it’s lasted well and she still plays with it now. I’ve now brought her the movie one for this year. £20 is a very good price! And I’d recommend it for any my little pony fan! Lego Walt Disney world castle, this set has been out for a while but never had any big discounts, and still £300 at lego site so now seems the perfect time to buy with £60 off! Online for £35 But in store for £23.45 great price and really nice gift for Christmas. They have wooden furniture set for £9 too. Found this in Asda Harlow. They have lots of them. Had an email alert to say the castle was back in stock, but it is now back up to £6.50, all the wooden puzzles are full price again. Deal expired. Tower of London showing full price now (annoyed) Was going to buy as a stocking filler. Looks like I missed the discount. Good discount on the Disney Princess Sleeping Beauty Castle. Plus postage if you don't have prime. Its around this price at BnM stores, seen it the other day! Thanks for posting OP. Looks wonderful, one ordered for our youngest granddaughter. Great find! Daughter will love this for Christmas.